There's a part of me that would like to take this opportunity to make my annual anti-pumpkin spice rant. It's that time of year, as Nathan started out last week, and as one Facebook fan put it, time for "white girls (to) rejoice! ", and as we were quick to add, also white guys comfortable with their masculinity. What a little of sprinkling of nutmeg, cinnamon and cloves has to do with given personal identity characteristics, I don't know, but...I'm not a fan. The "pumpkin spice everything" trend is far too ubiquitous, far too obnoxious, far too usurping of many other great fall flavors. It takes something rather special to really impress me in the pumpkin spice regard, so it's possible, but far too many items fall short. Pumpkin spice latte? I've rather have nutmegged toilet water, thank you. On the other hand...apples. Apple crisp. Apple cider. Applesauce. Apple pie. Now that's something to get behind. Especially apple pie, cuz I'm 'murican, dangit. Forget any other political attack ad going on right now, if an ad came out that a politician didn't like apple pie, they'd lose my vote. Now, I've heard that adding a slice of cheddar cheese to apple pie makes it even better...I've never tried. Either it's my mom's or sister's apple pie, which is absolutely perfect as is, or if I'm need of dairy sidekick, I'd choose vanilla ice cream. 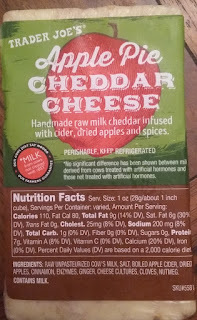 So Trader Joe's Apple Pie Cheddar Cheese is my first foray into crossing these two flavor streams. I know, I probably haven't lived...sorry. Same for Sandy. At least we were both super eager to give a chunk a whirl, even with its slightly-high-for-TJ's price of $10 a pound. It's...interesting, to say the least. First of all, it's pretty strongly applicious. How can one up the applicity factor of an average apple? Boil in apple cider! Infuise more apple! Stat! I can't quite tell the type of apple used, but I'd guess something in the MacIntosh-type range - strong, yet not overly sweet nor tart. There's also enough presence for the typical pie spices like cinnamon and nutmeg that give it a pie-like vibe. The little tidbits of dried apple add a little taste and textural variant. Nothing wrong on the apple front. I guess where it gets a little weird is the cheese. In of itself, it's a decent cheddar - soft, mild, not overly sharp, but rather salty. Must be that sodium that, to me, creates a little flavor friction. Salt and apples don't go together all that well, IMHO. 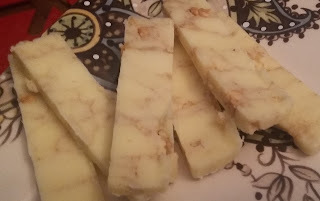 I mean, it's not awful...I kinda like the creaminess of the cheese paired with the apples - but the salt, instead of accentuating the overall flavor, kinda muddies it up instead. Also, if it's apple pie cheese, where's the pie crust tidbits? There's none, and that coulda been fun. 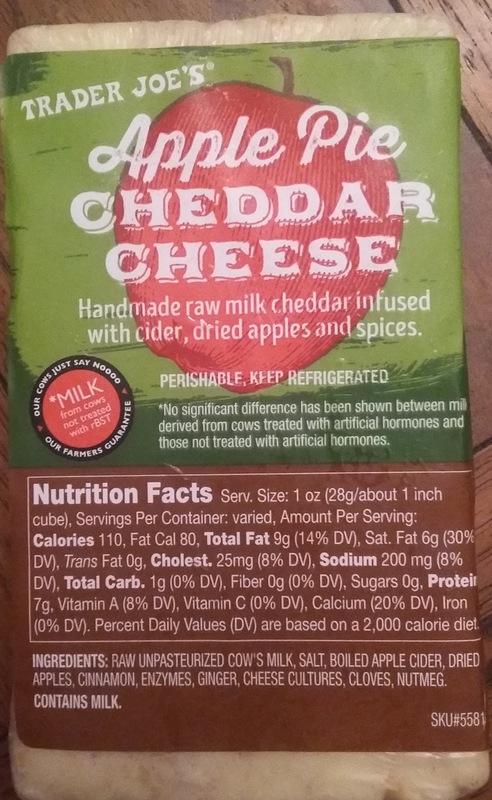 I guess "apple pie cheddar" sounds nicer than "fancy applesauce cheddar." Meh. We're kinda split here - not terrific, not awful, and certainly more successful than previous TJ cheddar mash-ups. Sandy's not entirely sure of what to make of it, except she'll reserve further judgment until trying out a grilled cheese with it. She went right down the middle with a 2.5. It's worthy of higher marks than that in my book, but I can't get over the salt - a few small bites left me in want of a tall glass of water. Heck, I'd even drink a pumpkin spice latte if it were close by just to help. I can't go higher than 3.5. I tasted it yesterday at my TJ's. They sampled it with a ginger snap and, eaten together, they were curiously delicious. Not enough for me to buy but hit the spot while I was at the store. Haven't seen this yet... The name alone makes u wonder who in the TJ food dept. came up w/this? were they smokin' a bud at the time? I asked the nice lady whom worked at the sample counter if I could try it because they were giving out different samples of food. She gave me a sample and it was really not great. Very weak and barely any cinnamon taste. No apple flavor at all. I wished that the apple flavor was stronger. I stand by my previous comment of "terrible" - being lazy, I have not yet returned this to T-Joes for replacement with something that actually tastes like cheese (Syrah soaked Toscano, possibly) and my husband was eating it this weekend. So I tried it again. Sorry, I just can't. But I do hope TJoes continues to try interesting flavor cheese combos - this one was just a swing and a miss, IMHO. Good thing I'm not the only one. The idea is there but missed the mark. Try the cinnamon toscano it really good!!! Got some cinnamon flavor seeping in cheese but not too cinnamony. I haven't tried the cinnamon toscano yet, but thanks for the recommendation, I will! Now I wonder how long it will be before the pumpkin-spice gets added to cheese? Cream cheese doesn't count! In addition to cheddar on pie, I heartily recommend making a grilled cheese with sliced apples. Deeelicious. I am also not a fan of pumpkin things. Wish there were more sweet potato flavored things. The pies are similar enough that I'll take either, but that's where it ends. Thin slice of a crisp not too sweet apple, with a thin slice of aged sharp cheddar on top. Eat together. Apple pie spices stay in the cupboard across the kitchen. trader joe's has some really interesting cheeses - i just found a pesto gouda that's quickly becoming my favorite!